for fear of upsetting people), if we consider ourselves as bipedal primates in the great ape family it does make us a bit more humble, don’t you think? And that certainly helps in our relationship with animals. 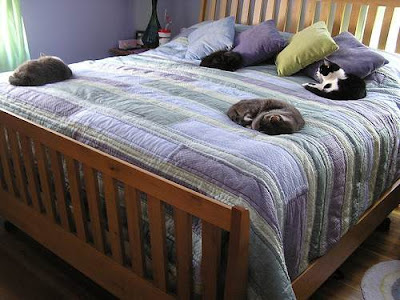 Do you allow your cat on the bed at night? I do. I always have and I have never caught the plague or chagas disease, two diseases that are quoted in the study that can be transmitted to us from cats. There is also taxoplasmosis and more – see more here: Zoonotic disease carried by cats (an earlier post not related to this study). I have not seen the study referred to, incidentally, but I have seen articles that refer to it. To mention the plague as a zoonotic disease in this context is not sensible. It is too sensationalist. In a strict sense Bruno is correct, we can get a disease from our cat. But we can also get a disease from a human and are more likely to do so, in my opinion. Should we push our significant other half out of the bed at night!? Ruth – Kattaddorra – and Jo worn out! Going wider we can get injured anywhere and at anytime. We have to take some risks in life and the benefits of living and sleeping with a cat far outweigh the very slight, almost minuscule risk of catching some rare disease. Accordingly, looking at a cat sleeping on the bed next to you at night in a common sense and rounded way, it seems to me that the good scientist is looking at the subject from a much too narrow and purely scientific manner. He says that the bed should be a private place that is out of bounds to your cat companion. If you want a cat in the bed with you make it a plush toy! I can think of a few cat owners who I would advise to do that – cat declawers in case you didn’t get my meaning. Apparently a good percentage of people let their cat or dog sleep with them (up to 62% apparently but the figure is a guess it seems). A commentator on the Gather website says that people should wash their hands after playing with their pets. She probably gets this from Bruno’s study. Have you ever done that? It means that you should wash your hands after stroking your cat – impossible and mad. If you feel like doing that you definitely need to buy a large, cat plush toy substitute! I wonder if Bruno’s study is a reflection of modern life. The risk averse, health and safety mad world we now live in. In Britain this translates to a wide range of behaviour changes in humans from driving children to school when once they might have walked and the stopping of school adventure outings etc. Children are meant to be more vulnerable to catching a zoonotic disease but as a counter argument children should be exposed to risk and a bit of disease to build up their immunity. Once again it is a balancing act based on common sense and a wide viewpoint. There is one other factor. Some cats like to sleep next to us. They like to be on the bed. It benefits them. We have a duty to do our best for our cat companions as family members. 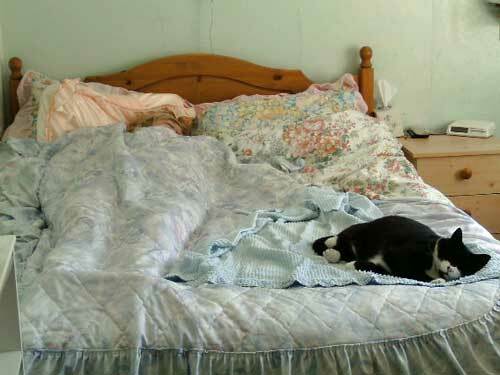 Is not that something that should be factored in when making a decision whether our cat should be allowed on the bed? My old lady cat is on my bed right now. She is next to me and she has just meowed to say, “Where is my fish lunch?” “It’s coming”, I say. Time to stop and get that fish in the microwave! If this scientist you quote really has done so much study on zoonotic diseases, then why is he even bothering to write about cats? Cats make good pets, in part, because there are few (if any) diseases we can catch from them or pass onto them. I think he just hates cats and he’s looking for justification of his anti-cat inclinations. If this were not so he’d be writing about those potbellied pigs some people keep as pets. You say, Michael, that we’re related to apes, but on a cellular level we might be closer to pigs. If you have a pet pig you can catch a virus from it or pass a sickness to that pet. Pigs can catch a bird virus humans normally can’t get, but a human can get this same virus from the pig. Remember H1N1, the swine flu? That was a fat lot of nothing, but the 1918 pandemic wasn’t. I read a book on it and some scientists think it went from chickens to pigs to people. Scary stuff. That is why I think the author of the study you quote just has a beef with cats. Otherwise he’d be warning people of the very real risks associated with pet pigs and leaving the cat alone. I have to admit, in the last one year my cat has come closer to me. He never used to sleep on the bed at night. And i have realised that could be because both me and my husband would be out on work most of the day, so our cat would be alone most of the day, except for evenings when we would be home. So in a sense he was not really close to us. But for the last one year we have been working out of home and we see a drastic change in our cat, Danny! He wud sleep a bit, wake up and play with us, through the day. And he demands to be cuddled more often, and of course sleeps with us on the bed 🙂 which we absolutely love. We cant possibly have a pet and expect him to not share our space with us! That’s only natural. What a load of tosh Mr Chomel spouts. I’ve had cats on my bed all my life from being a small child and they’ve never hurt me. Mr Chomel wants something better to do with his time than to try to blacken our cats valued companionship at night. Jan 25, 2011 Pets , dangerous for human health. Read this article and was not surprised at the scare news for pet owners used to cuddling their pets at home, including myself.From infancy i have been associated with all kinds of pets and to date haven’t suffered any “Pet inflicted” contagious disease.My cats matahari and matata are co-owners of my house having full access to my beds, chairs, except personel food, a part of my human family. To date , the mosquito plague of Mumbai gave me “Malaria” in June 2010, my most serious disease in recent years rather than any pet contagious disease.Study has also proven that cjildren brought up with pets grow up stronger and hardier.Exceptions are always prevelant and some humans could be allergic to certain pets or animals, but thats rare, hence the popularity of house-hold pets.As for me, honestly, without my pets, i would be a different human being, including my passion for blogging in which my pets are documented for the help of other pet owners. Jan 25, 2011 For goodnes sake! Oh please! I’ve had cats on my bed all my life and never caught any disease and I’ve never had allergies. To the contrary cats are supposed to support our well being in that they are supposed to lower blood pressure. I could never do without my Alfie cat when I go to bed; indeed he is usually there before me! His presence makes me feel content. Whatever next! I think you’re right, Michael we probably catch more diseases from humans! Well said Ruth. A common sense view point that we should all follow. When I was young our family always had dogs and let me tell you there’s not much room in the bed for 2 sisters sharing with German Shepherds and then later a huge rough haired collie too. Since then, after 37 years of various cats as my bedmates I’d be very lonely at night now without Jozef who shares my bed at present. He’s the most peaceful little bedmate ever. I think that the reason so many children have allergies nowadays is that they don’t get the chance to build up immunity like we did. Our late mother would say ‘A peck of dirt never hurt anyone’ and I agree. Yes it’s nice to be clean and hygenic to a certain degree but in my opinion it can be carried too far and anyway cats are far cleaner than a lot of people are !